Earn $22.49 in Rewards credit. Click to learn more. Aerodynamic, comfortable or safe? Pick three. The debate between "aero" and comfort is over. The Giro Synthe has the most efficient aerodynamic profile of any of Giro's previous road helmets while also touting better cooling power than their lightest weight Aeon™. And now with MIPS Multi-directional Impact Protection System, the Synthe is safer ever before. Recommended as one of Bicycling Magazine's top helmets of 2016. 270 g. Available in multiple colorways. Ponytail compatible. Unisex sizing. Small: 20-21.75" head circumference just above ears. Medium: 21.75-23.25" Large: 23.25-24.75"
This is a great helmet. I have an older version as well. My Smith glasses fit perfectly. I'm on my third Giro Synthe Mips. They fit me really well, are incredibly lightweight, and protect your head really well. I've had a couple of serious knocks in the head, serious enough to warrant a new helmet, and the Synthe Mips protected me head really well. From Atmos to Synthe MIPS. After 5years of use had to retire my trusty GIRO Atmos...Hello Synthe! Lightweight, good aero profile while very well vented and MIPS tech upgrade are all quite welcome. The interior is well cushioned and the straps are snug and comfy on your face. the dial ratchet is really adjustable and works better than the Atmos press-on system. Color schemes of all types avail..my white red orange gets plenty of nice lid remarks during training rides. I had been using a Savant MIPS, upgraded to the Synthe MIPS when there was a sale, and love it. It's so comfortable I hardly even think about it while riding, other than occasionally adjusting the micro adjuster, which I can do on the bike. The micro adjuster is extremely handy to compensate for the change when I put a skullcap on or off in the winter. I also like that the height of the rear band mount is adjustable, easy to get the fit snug but not tight. The sunglasses dock seems mainly useful for pros (who have sunglasses sponsors) or folks who wear cheap sunglasses. Me, I need glasses to see where I'm going so (a) I'm not going to take them off while riding and (b) even if I did, they are Transitions Progressive lenses, which are FAR too expensive to risk leaving perched on the helmet where they might fall to the ground if I forgot they were there when I removed my helmet. And if they fell off and broke, finding my way home would be a problem! So I just keep my glasses on and fasten the helmet straps over them. This is the second Synthe mips helmet I have purchased for my wife. Last one was damaged in transit while stuffed in a suitcase. Inner fitting system broken and not replaceable I this helmet. Great style, fit, weight, and safety. I wear one also. After I ordered, I wished I had a visor for when I go mountain bike riding, but really I wouldn't change a thing. This helmet was a HUGE upgrade than my current helmet. I ride 20 miles on the weekdays (2-3 days per week) and 35-50 miles a day on the weekends, so I am in my helmet quite a bit. I love the fit of the cage on this helmet - it is very snug. I also like the materials that are used for cusion - they are not absorbant and seem very durable. About the only negative I can find is that there is a structural band that goes from left to right across the helmet that limits attaching lights to your helmet if you do early morning or late night riding. I am sold on MIPS after crashing and seeing how the impact force was distributed. Broke the helmet and didn't feel the impact as much as I had expected. I immediately replaced the helmet with a new Synthe MIPS. My prior helmet was a Giro Pro-light which was not as heavy as the Synthe, but I consider this a fair trade-off, though I do miss the lighter helmet. This is a great light helmet with excellent ventilation and improved safety utilizing the MIPS system. This is my everyday helmet and I recently wore it while racing at the National Senior Games in Birmingham, AL finishing on the podium twice. It just looks fast! I love this helmet. I inherited my mothers large head so it looks like a normal sized one when I wear it. Excellent styling and stoked about MIPS. 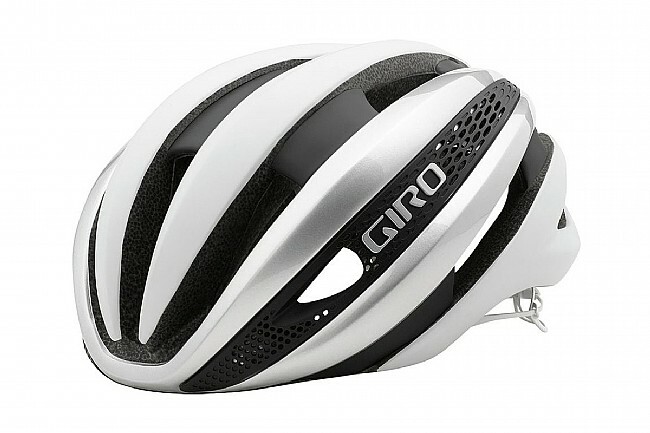 The Giro Synthe is an all around great helmet. It's light and breathable, yet it feels really secure on your head. It can easily accommodate a cap with the visor flipped up, yet somehow also sits nicely low on my forehead. The venting is very good yet the helmet it quiet and does not create a lot of wind noise. I'm very impressed! Comfortable helmet, looks nice, and appreciate the sun glasses holder. Luckily havent experienced the helmet ina wreck, but Im sure it will work. I have been using Giro helmets for almost 20 years including the Pnuemo, Atmos, Ionos, Aeon and now the Synthe MIPS. The Synthe is the most comfortable helmet I have ever worn. It is not as light as the Aeon but because of the fit and the excellent ventilation it feels as light. I ride 200 miles a week in the Phoenix Az area and really appreciate the fit and ventilation of the Synthe. I have not worn it on the bike yet, but I have tried it on and it fits great like all of my previous Giro helmets. Loving the matte black finish to the helmet. Also easily the lightest helmet I've ever had. Fit adjustment works great, and the MIPS seems like it would work. Really loving the sleek look that Giro puts out. I've been using Giro helmets since the first model came out with the hairnet cover. At least two mountain bike helmets, a couple of Atmos, and now the Synthes followed. I bought my first Synthe MIPS because it was so damn comfortable finally a helmet that fits! Added plus I like the color (matte whitesilver) and I got it on sale. A whole-hearted recommendation. This is definitely the best helmet I have owned. Very comfortable and nice looking. I have owned nothing but Giro helmets for years and this is the best yet. Very comfortable. Like the secure feeling and adjustment with the MIPS system. I wore two Giro Savant helmets over the last 4 years but recently decided to upgrade to the Synthe. I chose the Synthe because it seemed to have a cool, sleek, more modern feel to it, and the color choices were excellent to boot. After riding with this helmet daily for a few months now, I can say for certain that its awesomehowever, Im not sure Id purchase a helmet online again without trying it on in person since this helmet feels just slightly smaller than my old Savant did, even after adjusting both the rear dial and chin straps. That said, Id still recommend this helmet to anyone looking for a higher quality upgrade.